Caryn Douglas gave a wonderful speech to the assembled guests about the place of the spiral in our culture and tradition. 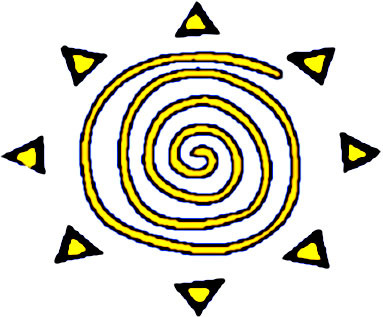 It is an ancient symbol with pagan origins (i.e. having to do with the earth) whose coils suggest hidden and untapped power. The spiral evokes the perpetual motion of life as a continual and evolving process within the cycles of time. Although each loop brings us back to the same place, it takes us to a higher and more evolved level. It is a symbol that is associated with feminist spirituality (think of “Sarah’s Spiral” vs. “Jacob’s Ladder”), with Celtic spirituality, and with The Centre for Christian Studies. I spoke about the spiral as a tool for learning and for theological reflection that has had a transformative effect on many students of CCS. It seems to me that Lori’s curiosity, research, interviews and analysis of the power of the learning spiral demonstrates an alternative approach to learning and formation for ministry that we value at CCS – not a poor cousin to the academic approach used by many theological colleges, but a distinctive methodology with its own integrity and rigour. Bravo Lori, for giving this Spiral model a name and place in the halls of educational discourse! Readers of the CCS blog should know something else about Lori. In the weeks leading up to the 120th Anniversary Weekend, Lori will be on contract with CCS to coordinate and attend to the detail work needed to make the Weekend a success. The 120th Planning Team (Barbara Barnett, Charlotte Caron, and Irene Rainey plus Helen Reed, chair of Communications and Promotion Committee and still Marc Desrosiers, as he is able) is delighted she is available and willing to do this. You can expect to hear from her in the near future, to encourage to attend, to ask for your volunteer time, to answer questions and attend to logistics. Once again, CCS has brought together theory and practice in a wonderful, spiral combination that takes us to an ever higher and more evolved level!